You know it is a small, digital and virtual world when you start receiving guests who are friends of friends, when all the parties have met through the internet and, in the case of the friend and the friend of the friend, they’ve never met in person! So it was this week as I had a visitor who was recommended to contact me by Curry. 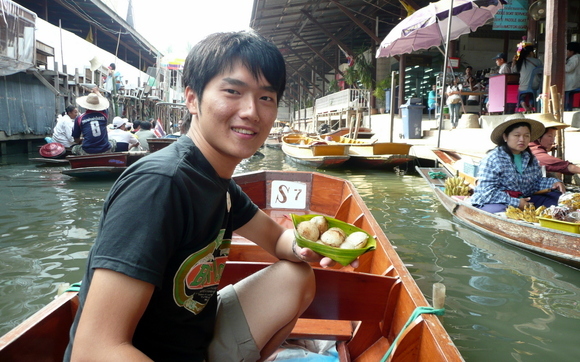 After completing five years studying in Hiroshima, Japan, Fu was traveling around Asia on his way back home to southern Malaysia. Nice guy and this is his first visit to Thailand. Originally, Curry had recommended Fu contact me so I could take him to Pad Thai Ari. This ended up not being part of the plan as Fu was in his final days in the country and was interested in seeing the floating market. 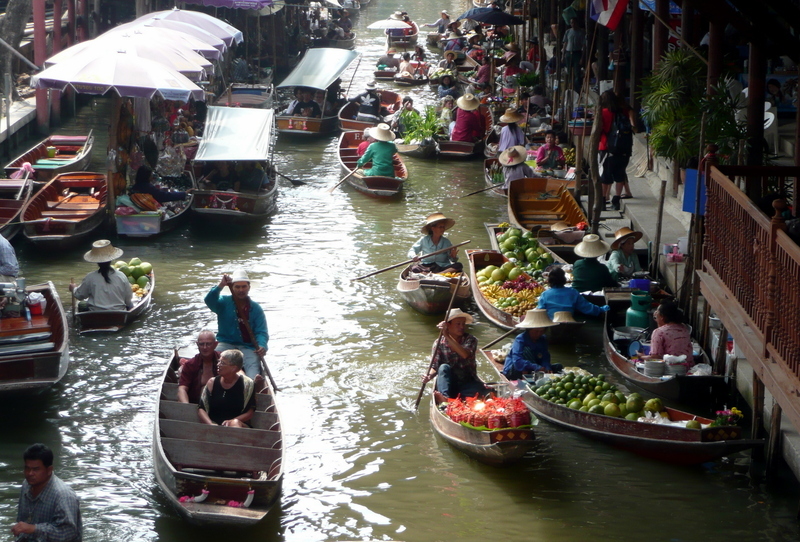 There are several floating markets but the only one that runs every day is the one in Damnoen Saduak (“convenient pathway”) which is near the school in Bangkhonthiinai. I met Fu at 6:30 so we could beat the crowds and we arrived at the market just after 8:00. Things were still cool and uncrowded and I negotiated a two-hour ride in a dugout boat. Tawn suggested that I use this negotiation technique: after rejecting the original quote out of hand, I was to say “phom mai bpen muu” – I am not a pig, a reference to the slang term of someone who is an easy mark. The lady running the boat tours thought that was funny and decreased the price a bit. The two hours were nice, the occasional annoying buzz of a long tail boat (which are powered by old Toyota pickup engines) breaking the otherwise tranquil nature of life along the canal. Of course “life along the canal” means people who sell tacky souvenirs from shops in front of their homes. Each shop is the same as the next, some selling vaguely “Thai” souvenirs and others selling things that are totally incongruous. 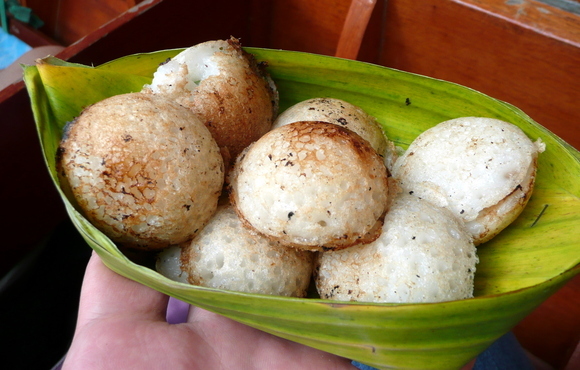 Above: Sampling some khanom khrug – a rice flour pancake that is a little sweet and a little savory at the same time. Below: Along the way, I purchased a few bottles of local honey from this lady and her young daughter. 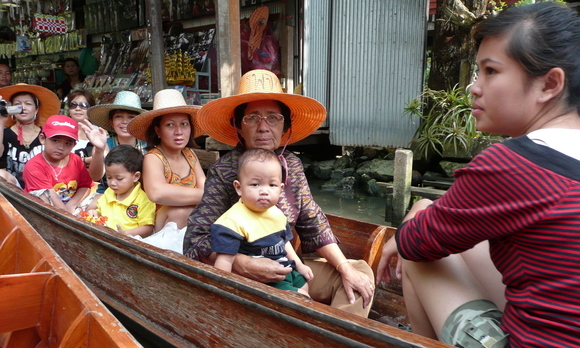 Above: Even Thais come to see the floating market! By the time we were wrapping up after 10:00, the Russian tourists had arrived by the boatload and things were less pleasant. It was a good time to be finishing. 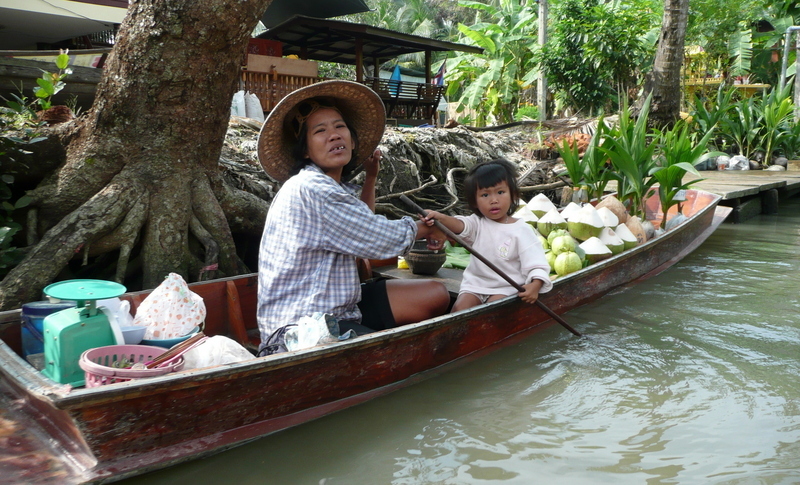 After taking some pictures from the shore, we headed to Bangkhonthiinai for a quick visit. I wasn’t sure if the school was back in session after their winter break, but everyone was there (except for the now-retired Ajarn Yai) and so we spent about an hour with the children, practicing basic questions and answers. Hopefully a good experience for Fu. 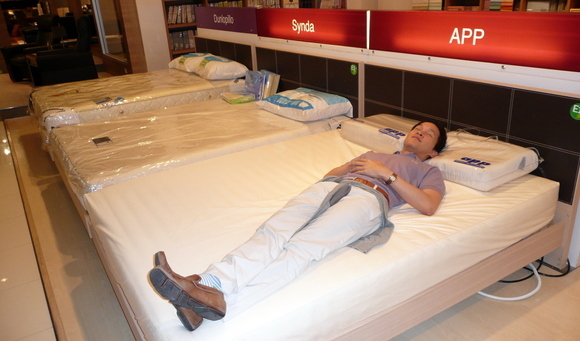 In other news, our contractor Khun Guang assures us that we’ll have access to the house next Friday. Still some fixturing after that, but only small things. That should give us two weeks to get moved in. Below: Tawn test-drives some mattresses. This entry was posted in Uncategorized and tagged Damnoen Saduak, Floating Market, Khanom Khrug, Samut Songkhram, Thai Dessert, Thai Food, Thailand by christao408. Bookmark the permalink. Coconut milk is one main ingredient of Kranom Krog too. I haven’t had one for years! OMG!!! such an amazing ride. if I ever make it to the big mango, you have to be my tour guide as well. 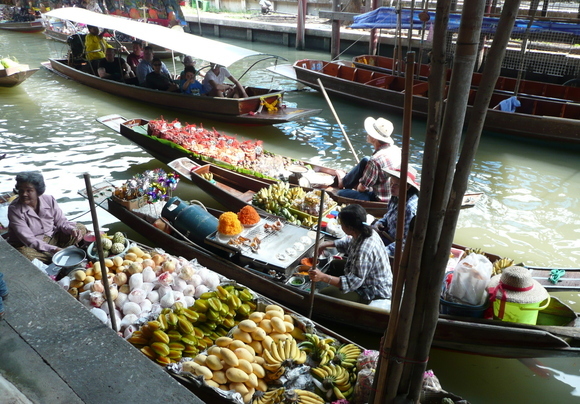 Ah, looks like business as usual at the floating market. That khanom khrug looks yummy…I’m sure Fu was having fun sampling the local food! I’m excited for you guys moving to the new dig very soon! !